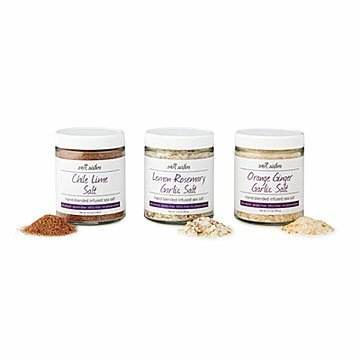 Charmane Skillen's savory, aromatic seasoning trio pairs unrefined sea salts with bright citrus flavors. The combo of salty and sour is a cooking superpower. Charmane Skillen's trio of unrefined, small-batch citrus finishing salts take it into savory—and amazingly aromatic—territory. Handmade in Goshen, Indiana. Chile Lime Salt - Chiles give this blend a pleasant warming heat that the lime juice beautifully brightens. Sprinkle on fresh fruit or black beans, or make Mexican elote by coating corn on the cob with mayonnaise, lime juice, cotija, or feta cheese and a sprinkle of this salt. Lemon Rosemary Garlic Salt - This blend of garlic, zingy citrus, and piney rosemary adds savory depth and a refreshing lemon note to grains like wild rice, quinoa, and buckwheat, or any assortment of cooked vegetables. Orange Ginger Garlic Salt - Sweet, spicy, and savory all at once, this blend elevates any Asian-inspired dish. Use it on stir-fres, in marinades, or salad dressings. Click here for recipes using the Citrus Salts. Charmane Skillen developed a passion for cooking while learning how to keep herself and her family healthy. Through a chance meeting in a small spice shop in Savannah, Georgia, she learned about unrefined salt. She devoted herself to researching the difference between it and the processed table salt we all grew up with. Now, it's the most important ingredient in her kitchen. She started making and selling her own food products in regional farmers markets. Thanks to their popularity,she now offers a range of all-natural, gluten-free, MSG-free and non-GMO products with no preservatives. Her products are designed to add rich flavor to real foods, and make eating healthy a delicious experience for her customers. I like to cook and I've found the lemon rosemary garlic salt great on fish. The orange ginger garlic salt is perfect on a pork roast and I love the chili lime as a rimmer for a bloody mary. Be creative.